I recently asked the question on my Glorious Treats Facebook page, “…what make a brownie perfect to you?” Although there was quite a range of descriptions (and I love how passionate you all are about brownies! ), the vast majority included the word “fudgy” in your description. If you are one of those “fudgy” brownie lovers, these are for you! If you like “cakey” brownies, you may still want to give these a try… they may have just enough (flavor/texture) balance to win you over! These brownies are rich, full of chocolate flavor, fudgy and moist (without being overly dense or oily). I would describe them as “better than a boxed mix” brownies. They have very similar qualities to a great boxed mix, but a deeper flavor. I’ve made (and eaten) quite a few brownies in my life. 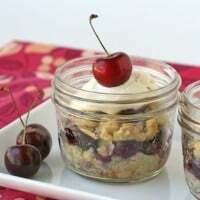 They are one of my favorite desserts. I’ve been searching for a perfect homemade brownie recipe for a while, and I believe I’ve found it! Rich, moist and fudgy, without being overly dense. Preheat oven to 350*F and lightly grease a 9"x13" pan. If desired, line bottom of pan with parchment paper. In a large bowl, add 4 eggs, and beat with cocoa, salt, baking powder, espresso powder and vanilla. Stir until fully combined and smooth. In a medium sized bowl, melt butter in the microwave (or melt in a small sauce pan on the stove). When melted, add sugar, and stir to combine. Add warm butter/sugar mixture to the egg/cocoa mixture, stiring until smooth. Make sure the butter mixture is warm, but not too hot, or it will scramble your eggs. Add the flour and chocolate chips to batter and stir until fully incorporated. Spread batter into prepared pan, and smooth as needed. Bake brownies about 30 minutes. Test for doneness by inserting a toothpick in the center of the brownies and making a little divit so you can see the center a bit. You should find moist crumbs, but no wet batter. Cool pan on wire cooling rack. Notes- For the best flavor, use the best quality cocoa powder you can. The original recipe calls for dutch cocoa, I used natural (not dutch) cocoa with great results, so I imagine you could use either. The addition of the small amount of espresso powder will not impart any coffee flavor in the final brownies, it simply enhances the chocolate flavor. If you'd like the choocolate chips to remain intact in the baked brownies, allow the batter to cool before adding chips. Certainly, if you like nuts in your brownies, free free to add them at the same time as the chocolate chips. Enjoy these delicious brownies with a glass of milk, or scoop of vanilla ice cream. They are sure to be a family favorite! Celebrating the Sweetness of 2011! I made these brownies. They look delicious! I just want to make sure that I was supposed to use 1 & 1/4 cup of cocoa powder, not just 1/4. Thanks! Dear Glory, i have tasted these brownies at my best friends party they were so moist. I actualy want to be a baker when i grow up so to me you and your brownies are an inspiration. I was also wondering do we have to use challenge butter and why? These look wonderful, and seem easy to put together. I have always had trouble getting a nice sharp edge on the brownie when I cut them. (As pictured here) Do I cut them while still warm, or let them cool completely? Serrated knife, or regular knife. Any advise would be helpful. Thanks. I would use a square chopping knife or a non serrated and lightly spat with pam cooking oil or take a paper towel and dip in oil and rub along sides of knife.. They should have a nice clean sharp cut that way. Idk if I would do it while they’re warm as I feel like when I cut mine warm they get messy but maybe with the oil technique they won’t.. Is still let them cool a little bit. 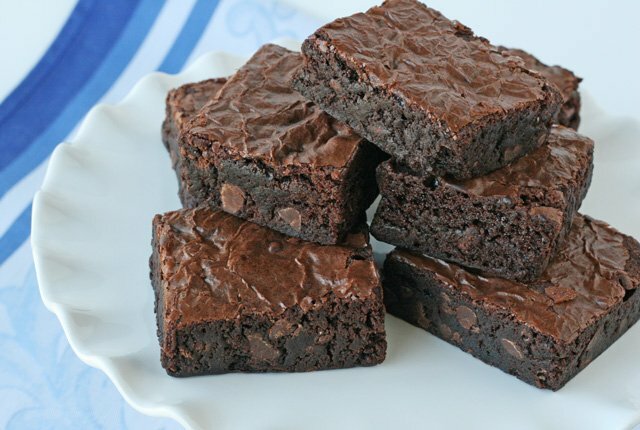 Tried these today and it was the first time I attempted to make homemade brownies. They were delish! My hubby was so impressed we’re never buying the boxes again! Oooh, these look delicious! Usually make them from the box but will try and make them from scratch next time. What is challenge butter? I’m in Australia! Made these tonight. They are pretty yummy! Thank you very much!!! These brownies are delicious. Hi, mine didnt work out.. before I put them in the oven my brownies were dense and groomy for all the sugar 😐 what did I do wrong here? it was the mixing butter with sugar? how its supossed to be the mix after every step? I did it exact the way you said it..
Have been meaning to comment for a while.. Made these 3 months ago and never bought store bought mix again. 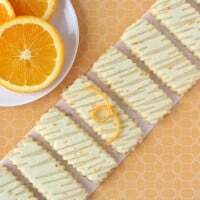 Hubby, who usually doesn’t like sweets what blown away by this tasty recipe! They are the perfect brownies! I live in Denver. Is there any alterations you suggest for high altitude? I made them and it took 55 minutes to cook. Hi Brandon, I bake a close to sea level, so I’m really no expert at high altitude baking at all. I would suggest you do a little google searching and I’m sure you could find some hand information to print out and keep in your kitchen as to how to adjust most recipes. Happy baking! 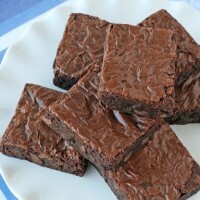 I just made these truly “perfect” brownies, i’ve been searching for the right recipe for some time now! My compliments to the baker, chapeau ! Hi I was wondering how did you get the flaky layer on top of the brownies because thats the way I like them and my brow nines never come out like that? my only thought for next time, I thought they had a wee bit too much salt for my taste (don’t know if challenge butter is unsalted or not). but I would use unsalted butter next time, or used salted butter and drop the added salt to 1/4 tsp. thanks for a terrific recipe!! So glad you enjoyed them! Now I that you’ve made me think of them I want to make a batch tonight! The standard for baking is to always use unsalted butter, which is what I do. I usually list it that way in the recipe as well, but I see I didn’t this time, so I’ll make that update now. Thanks again for you nice comment. These are amazing! Everyone loves them! Just made these and wow-ee they are good!! Thanks for the great recipe! I’ve made 2 pans with caramel icing for a wedding, and tonight I’m using this recipe to make neapolitan cheesecake brownies. 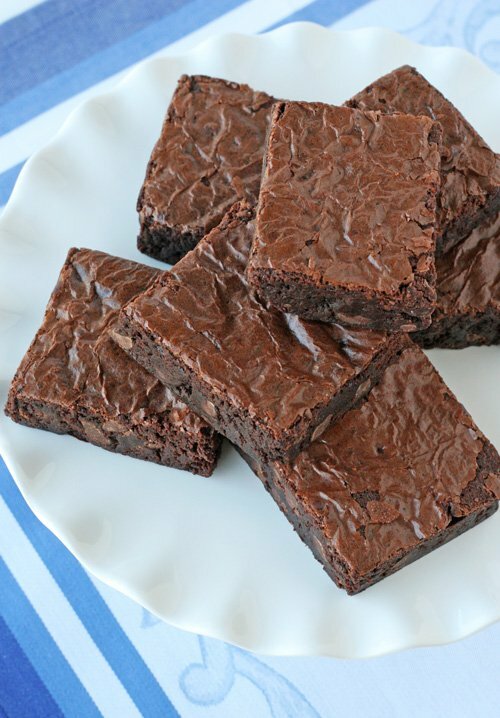 I’m a big fan of box brownies, and my homemade brownies never seem as good, but these were amazing! So rich without being overly sweet, so it was perfect with the really sweet caramel. Thanks so much for the sweet comment! So glad you’re enjoying the recipe! I never leave comments for any of the recipes I try, BUT—– This is BY FAR the BEST brownie recipe I have ever eaten or baked!!!!! This should be the “go to” recipe for EVERY baker!!! Love it. Thanks!!!!!!! 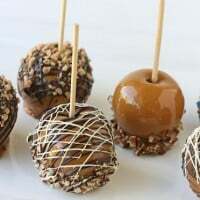 I’m making these right now and I’m so excited to eat them. I’ve made these many times now and they always come out perfect! Even when I don’t have any chocolate chips on hand, they still come out with a great chocolate flavor and perfect texture. Thanks for such a great recipe! Can you freeze your fudgy Perfect Homemade brownies? I’m baking for a big Christmas party I’m hosting in two weeks and I need items that freeze well! Love your website – your recipes have never failed me, I make them all the time and get rave reviews! These are Sooo yummy! I just shipped up a batch. I used gluten free flour (from trader joes) as I am allergic to wheat and I didn’t have espresso powder (bummer). They turned out perfect!! Enjoying one right now . Thanks for the great recipe! Made these tonight, and they are very good. I messed up and put two tablespoons of vanilla in, so they were a little too vanillas than I like. Other than that, very good.